German athletes have fun taking photos with the Olympic rings at an outdoor square in front of Gyeongpo Beach in Gangwon-do Province on Feb. 22. Gyeongpo Beach has become a popular photo spot among social media users, especially those who have traveled to Korea for the 2018 Winter Olympics. Many of them that Korea.net met at the beach said that one of the most memorable factors of their trip to Korea has been the friendly people. 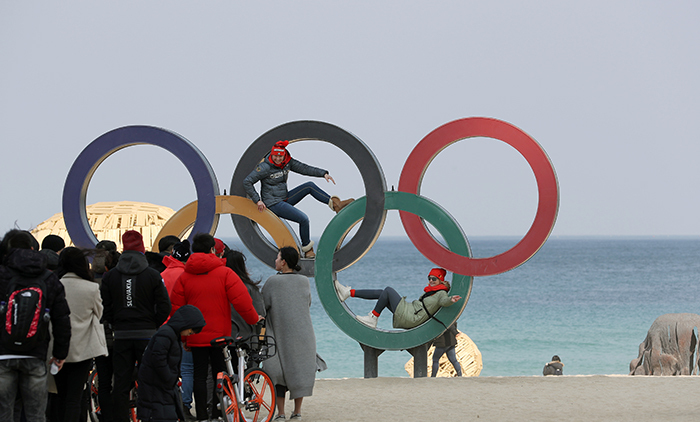 Visitors to Gyeongpo Beach queued up in a long line to snap photos with the Olympic rings on Feb. 22, despite the cold winter wind. Most of them said hello and asked the locals for help with their pictures, even though they were complete strangers. Angela Hernandez from Houston, Texas, said that many volunteers she met in Pyeongchang and Gangneung helped her to have good memories of her trip to Korea. She added with a smile that people here were so kind that she even said good bye to them almost 100 times. 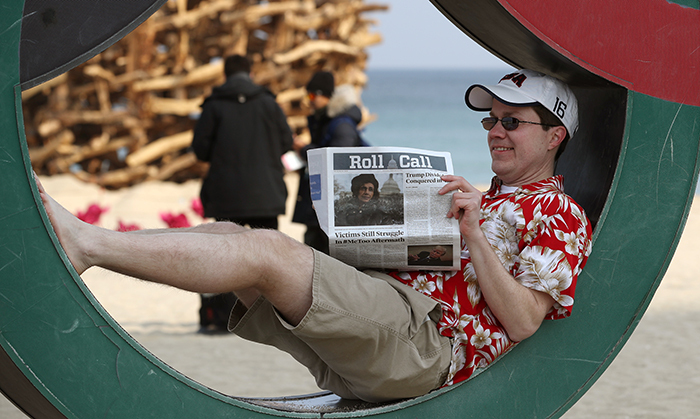 Scott Cunningham from Dallas, Texas, poses for a unique photo while pretending to read the Roll Call while wearing a Hawaiian shirt and shorts, at Gyeongpo Beach on Feb. 22. Scott Cunningham from Dallas, Texas, is one such traveler. Working as deputy chief of staff in the offices of Rep. Kenny Marchant (R-Texas), Cunningham said that he didn’t experience any inconveniences while traveling across Korea, except for getting lost once when looking for the proper stadium.Cunningham said he brought an issue of Roll Call, the U.S. Congress newspaper, to Gyeongpo Beach for his co-workers. He then posed in a so-called “concept photo” by pretending to read the paper on the Olympic rings while wearing a Hawaiian shirt and shorts. Lotte van Beek (right), silver medalist in the women’s speed skating team pursuit event, films a TV program with SBS broadcasting from the Netherlands at Gyeongpo Beach on Feb. 22. Many Olympians also praised the kindness of the people here. Athletes from Germany, Slovakia, Russia and the Netherlands who visited Gyeongpo Beach all said hello and waved to the people there, with bright smiles on their faces. Many of the athletes enjoyed taking photos with people when they were asked to take selfies together. Lotte van Beek, who won the silver medal in the women’s speed skating team pursuit event for the Netherlands the previous day, said that she is so happy to experience such kindness, as well as to feel the joy of winning the silver in the Olympics in her first trip to Korea, all while saying that she has been unforgettably moved. Jelte van der Goot, a journalist from Radio 538 in the Netherlands, said that he has traveled to many Asian countries so far, and that people in Korea have been the kindest people that he has met in East Asia. He said that it’s very impressive to see such clean streets and modernization. “The clean sand at Gyeongpo Beach tells us what Korea’s like. I even wonder how many people gather in this area in the summer,” said the Dutch journalist. "We will contact you as soon as possible."